The number of visits to Safeworks has more than quadrupled since it opened nine months ago. Traffic through Calgary's only safe consumption site has more than quadrupled since it opened nine months ago, something health officials hope is translating into reduced pressure on the city's emergency rooms. 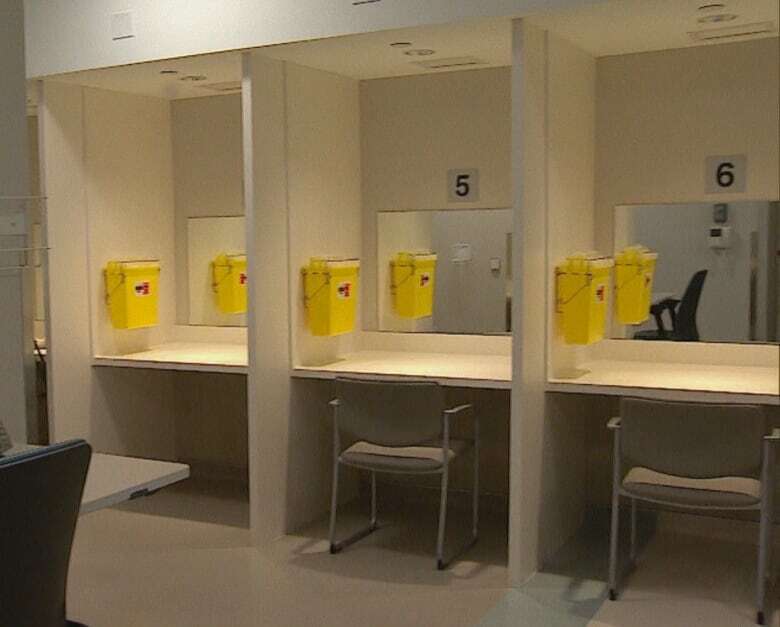 According to an Alberta Health Services report, there have been a total of 13,445 visits since Safeworks Supervised Consumption Services began operating in late October 2017. Safeworks — set up to reduce the province's growing number of opioid-related deaths — allows Calgarians to consume illicit drugs of all kinds under the supervision of specially trained nurses. "I would say the site is working," said Dr. Nick Etches, medical officer of health for AHS in the Calgary zone. "People are using the site. We are preventing overdoses, we are responding to overdoses. We are preventing EMS calls for those overdoses." In November 2017, its first full month of operations, Safeworks had 990 visits. By June 2018 there were 4,327 visits — by 680 Calgarians — with the majority of clients reporting that they are using methamphetamines and fentanyl. The clinic — which began as a temporary space in a trailer outside the Sheldon Chumir Health Centre in downtown Calgary — moved into its permanent home inside the Centre in January and it eventually expanded to 24-hour care. There have been 379 overdoses on site and nurses administered the opioid overdose antidote naloxone 178 times, according to AHS. Thirty-two of those patients had to be taken to hospital by EMS and there have been no deaths. "Their overdose is being managed medically by well-trained staff," said Etches. "And that's really important because oftentimes, before … emergency help would not have been available in that timely of a fashion." On the front lines, that's welcome news. "I'm impressed. To me that means that most of the consumption is occurring without complications. It's occurring safely and without need for resuscitation," said Dr. Eddy Lang, clinical department head for emergency medicine in Calgary. In Calgary, the number of opioid-related ER visits dropped from 694 in the third quarter of last year to 582 in the fourth quarter, according to AHS. Lang, who sees the impact of opioid overdoses in city ER's every day, wasn't surprised to see such a big increase in traffic through Safeworks once drug users discovered there was a safe alternative available. "Each of those safe consumptions could easily have been an EMS transport that came from someone's basement or from an alleyway," said Lang. While it is too early to draw any conclusions, doctors are reassured by an early trend they're seeing in Calgary's emergency rooms. An Alberta Health report reveals the provincial rate of emergency department visits — related to opioid and other substance use — dropped by 9.3 per cent in the last three months of 2017. "We know from other jurisdictions that have supervised consumption services, they have seen a decrease in emergency visits as a result of the implementation of those services. And so it's quite plausible the site could be having a beneficial effect on EMS calls," said Etches. EMS calls related to opioids are also down in Calgary, from 123.5 per 100,000 in the last five months of 2017, to 106.5 in January and February 2018. Safeworks staff are also working to connect clients with addictions supports. They have made more than 243 referrals to social workers, the opioid dependency program and other supports since the site opened.